Volkswagen’s Lane Assist is a system intended to help the driver stay within the intended lane of travel. At speeds above 65km/h, a camera mounted by the rear view mirror at the top of the windscreen detects lane marking ahead of the vehicle. Information from the camera is combined with data about the car’s speed and trajectory to calculate the time and distance before a lane marking would be crossed. 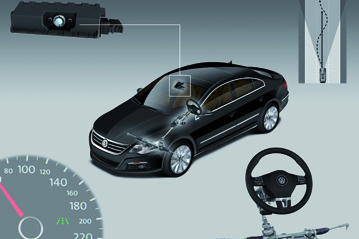 When one or other of those parameters is less than a critical value, Lane Assist intervenes by apply a gentle steering correction by means of the electric power steering fitted to the Passat. The amount of torque applied to the steering is small and can be easily overcome so that the driver remains in ultimate control of the vehicle at all times. The system is designed to assist the driver in cases where lane departure is unintentional. If the system is unable to correct the lane departure (because the curve is too sharp, for example), the system will additionally warn the driver through a steering wheel vibration. Lane Assist senses when the lane marking is being crossed deliberately: corrective steering is suppressed if the driver uses the direction indicators or if a decisive steering action is detected by the power steering unit. The system also deactivates if no steering input has been detected from the driver for some time (indicating that the driver is relying on Lane Assist to steer the car). Lane Assist fitted to the current Passat requires left and right lane markings to function properly. Euro NCAP is informed that the new Passat, due in early 2011, will be offered with a modified version of Lane Assist which can operate with only a single lane marking. Lane Assist is intended to address unintentional lane changes on rural roads and on highways, at speeds above 65km/h. Such accidents represent a disproportionate number of deaths and serious injuries, so it is for these injury severities that Lane Assist can provide the greatest benefit. Volkswagen estimates that Lane Assist could be effective in roughly half of all lane departure accidents which lead to a death or a serious injury. If all cars were equipped with a system such as Lane Assist, this would equate to a potential saving of more than 5000 deaths and nearly 40,000 serious injuries per year in EU 27. Lane Assist can be switched on and off by the driver. At the beginning of a new journey, the system restarts with the last on/off status: if the system has been switched off, it remains off at the beginning of the next journey. The system does not switch on by default at the start of a journey. Lane Assist relies on its camera to be able to distinguish road markings. In some cases, this might not be possible owing to poor contrast: driving towards a low sun, for example, or where there is little distinction between a lane marking and the side of the road. Similarly, Lane Assist may be unable to detect unusual lane markings such as in road works. The maximum corrective steering torque is also limited to ensure that the driver can remain in control of the vehicle. If a higher torque is needed to bring the car back into lane, Lane Assist will be unable to correct the lane departure but, in such circumstances, it will warn the driver. Lane Assist has been available since 2008 and Volkswagen has limited information about its real-world effectiveness. Euro NCAP’s reward is based on an analysis of the safety potential and the effectiveness of the system. Volkswagen conducted a number of track tests under controlled conditions during the development of Lane Assist. These ensured that the system met the intended functionality: corrective steering was applied and the car stays within the intended lane for the full range of speeds and bend radiuses for which the system was designed; and, conversely, the system deactivated in curves below the design radius, and where the driver appears not be steering the vehicle. The effectiveness of the computer at identifying road markings was determined from video analysis of real-life driving scenarios recorded all over Europe. In addition, test drivers assessed in real-world conditions the correct system functionality in a wide range of traffic, road and weather conditions across Europe.